Year over year, J&J’s adjusted earnings increased by 11.4% (9.8% when excluding the impact of translational currency). Its adjusted diluted earnings per share increased by 12.1% to $8.18 (10.4% when excluding the impact of translational currency). J&J’s net margin in 2018 was nearly 18.8%. Stock buybacks help boost earnings per share. The graph below shows that J&J reduced its share count by about 5% over five years’ time. This doesn’t seem very meaningful, but instead of rooting for the company to buy back shares, I’d much prefer the shares to be bought back at good valuations(, and, of course, dividend hikes!). And I hope management will keep that in mind when executing buybacks. The company announced in December 2018 that it would buy back up to $5 billion of stock. And so far, it has bought back about $1 billion. If the company bought back $4 billion of stock at $129 per share, it’d reduce the share count by about 1.1%. 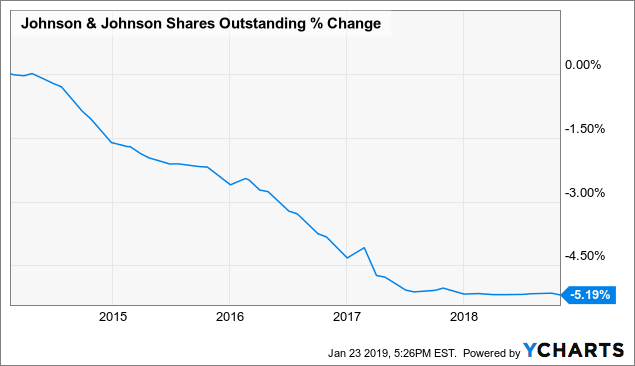 The buyback program gives more leeway than dividend hikes because J&J can choose to halt share buybacks if the stock shot up and became too expensive or if it found better uses for the capital. On the contrary, shareholders expect J&J’s dividend to be sustainably growing at a stable rate. Once it increases the dividend, shareholders don’t expect it to be cut. Valuation and Yield Analysis: Is It a Good Time to Buy? At $128.80 per share as of writing, J&J trades at a P/E of about 15.7, which is an OK valuation to pay for the AAA-rated company that tends to trade at a premium valuation. The S&P credit rating of “AAA” is a big achievement, as only one other company, Microsoft (NASDAQ:MSFT) is awarded that rating. The fundamental analysis graph below shows that the long-term normal multiple of J&J is roughly 16. For solid dividend growth stocks, such as J&J, looking at the yield history gives a hint about the stock valuation. The graph below shows the 10-year yield history. A ~3% yield indicates fair valuation. A ~3.6% yield indicates an attractive valuation. As of writing, J&J offers a yield of 2.8%. Assuming management declares a 6% dividend hike in late April, we’re looking at a forward yield of 2.96%. J&J has increased its dividend per share for 56 consecutive years with three-, five-, and 10-year dividend growth rates of 6.4%, 6.7%, and 7.4%, respectively. Its 2018 payout ratio was under 44% based on adjusted diluted earnings per share, while the ratio has ranged from 40-46% in the last 10 years. What Can You Expect from J&J in 2019? Management estimates adjusted earnings per share growth of 5.7-7.6% (a midpoint of 6.65%) in the operational perspective, but that the reported adjusted diluted earnings per share growth will be lower in the 3.9-5.8% range (a midpoint of 4.85%) due partly to foreign exchange impacts, largely from the conversion of Euros to USD. With the anticipation of slower growth, it’s no wonder the stock didn’t pop after releasing its recent results. That said, the following slide summarizes why you might still consider J&J as a long-term core holding. At best, J&J is fairly valued today. So, if you don’t own any shares but are interested, you can nibble at the stock. For a bigger margin of safety, buy at cheaper valuations. Are you buying J&J now or waiting for a better entry point? 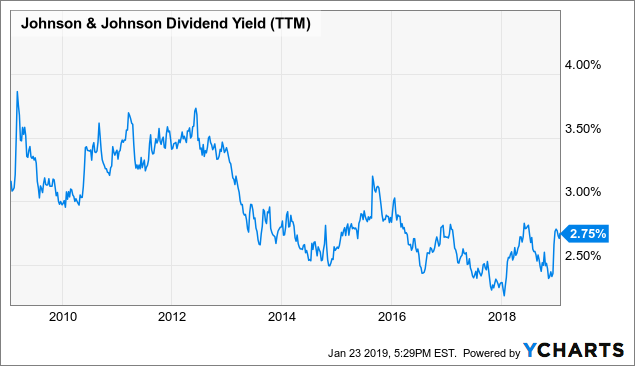 Which dividend aristocrats are you thinking of buying now? Which companies are at the top of your quality list? Which companies would you consider as your core holdings? This article first appeared a few days earlier for DGI Across North America subscribers, who also got analyst targets on JNJ, my commentary on JNJ’s technical chart, and my current buy target range on the stock. Disclosure: At the time of writing, the author owns JNJ.